Below is Chapter 6 of the Foresight Africa 2017 report, which explores six overarching themes that provide opportunities for Africa to overcome its obstacles and spur inclusive growth. You can also join the conversation on Twitter using #ForesightAfrica. In 2016 we saw major progress in addressing two crises that racked West Africa in recent years. First, cooperation between African governments, communities, civic organizations, and international partners overcame initial struggles and succeeded in ending the latest Ebola outbreak in Guinea, Liberia, and Sierra Leone. On March 29, the World Health Organization declared the crisis over. Second, while there is still much to be done, there has also been significant progress in the struggle to secure the Lake Chad Basin from the threat posed by Boko Haram. Although the threats from the group remain, the governments of the region have regained control of much of the territory previously held by Boko Haram. As we enter 2017, African governments and their international partners should reflect on the structural challenges that led each of these crises to escalate and on what lessons should be learned for future crisis prevention and response. Center-periphery divisions and local grievances persisted in the context of growing economies. 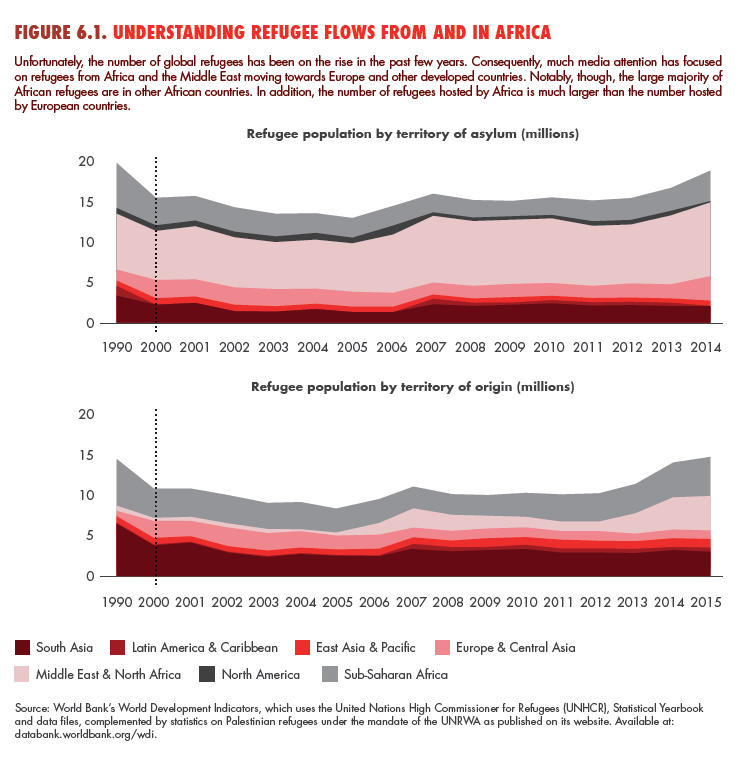 Both crises were complex regional threats that emerged in the border regions of relatively wealthy African states, but among populations that had deep-seated, and often well-founded, mistrust of their national governments. Ebola broke out in Guinea’s Forest region, an area that is home to some of the world’s richest iron mines but where minority ethnic and cultural groups have been historically marginalized and have seen few benefits from the region’s vast mineral wealth. Just six months before the Ebola outbreak, the region experienced ethnic riots against outsiders migrating to the region, who locals saw as benefiting from government support. The riots quickly spread to neighboring regions of Sierra Leone and Liberia, which share similar ethnicities, cultures, and landscapes. Meanwhile, Boko Haram originated in Maiduguri, a center for learning and trade in the Lake Chad Basin, but one of the poorest regions of Nigeria. The movement’s radical message gained traction in an area racked by desertification, poor infrastructure, and little hope for its youth to achieve their economic and social potential. Global connectivity drove the crises and the international response. Proponents of international development have long held that health systems and security in Africa cannot be segmented from the concerns of the wider world. The last three years have shown it to be true. Both crises were driven in part by factors outside the region, whether the migration of the Ebola virus to West Africa, the impact of state collapse in Libya on weapons availability across the Sahel, or the increased activity by international extremist groups such as ISIS to whom Boko Haram has ultimately claimed allegiance. Even as fears of global terrorism and pandemics triggered international concerns and mobilized a significant response, these fears also reversed the economic gains of a region struggling to shake an image of poor governance and civil strife, stretching government budgets and decreasing tax revenue. A whole-of-society approach to crisis management was required, but adopted too late. The rapid ascent of Boko Haram and the inefficiency of the initial response to Ebola demonstrated the weaknesses of how national—and then international—systems respond to crises. 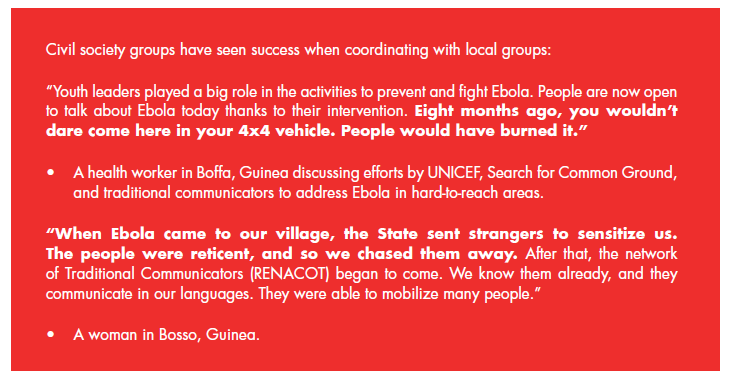 Ineffective communication with mistrustful communities in Ebola-affected areas led citizens to attack—and even kill—health workers. Eighteen months into the Ebola outbreak, health workers still faced attacks and blockages when they struggled to reach some communities. Abuses by Nigerian and regional militaries in responding to Boko Haram drove recruitment in the early days, and anti-terrorism operations were shrouded in secrecy. As late as mid-2015, many government and security officials working in northeast Nigeria had never held a public forum to discuss security or explain their work to civiliansliving in the affected areas. But despite this mistrust and the initial weaknesses in the state response, neither crisis was suitable for the kind of massive U.N.-coordinated mobilization of peacekeepers and agencies to replace fragile governments that we see in places like the Central African Republic, South Sudan, or in the eastern Democratic Republic of the Congo. It was only when government strategies shifted to working more directly with other structures in these regions, including traditional leaders, religious groups, and civil society, that the response was able to reverse the trends in the crises. As we go into 2017, African governments, civil society, and the international community should draw three key lessons about the challenges that led to these crises and the measures that ultimately turned the tide. Governments cannot do it alone, yet the role of non-state actors is often neglected and under-resourced in crisis response. While governments play a critical role in providing basic services across the continent, services are not exclusively the responsibility of the government. These are ultimately social issues, everyone has their role to play, and government needs to collaborate with citizens and communities to ensure a whole-of-society response. Community radio stations, religious leaders, town criers and griots, and youth clubs stepped up in the fight against Ebola where pre-recorded radio recordings and “sensitization” campaigns by international agencies and ministries of health were not successful. In Nigeria and Cameroon, traditional hunters and security groups, community organizations, and civilian government officials have played a key role in improving security and responding to the threat of Boko Haram, while in Niger, local “social cohesion” committees work with governments and aid agencies to organize the reception and assistance to refugees fleeing the violence. Civil society engagement is often limited to a “watchdog” role at the policy level. Non-state actors, whether in formal associations, community-based organizations, or in other institutions (religious, traditional, academic, business), can be key interlocutors to channel citizen input to governments and contribute to policy formulation. Yet, dominant models of civil society-led action and assistance typically overemphasize the adversarial role of civil society in checking state overreach, rather than supporting forums for dialogue and joint policy formulation. While civil society groups can play a key role in generating political will for change, public needs often exceed the capacity of governments to deliver services. Non-state actors must play a role not only in criticizing inaction or abuses of power, but also as active partners in crafting and implementing policies to respond to new challenges. In Nigeria, we are supporting “Community Security Architecture” for ordinary citizens to identify security risks, take local action, and jointly approach government agencies where necessary. All actors must reinforce a long-term emphasis on social accountability. Both crises underscored the legacy of deep distrust between state actors and the communities that they serve. The legacy of colonial and authoritarian rule deeply undermined the role of government agencies and personnel as public servants, particularly in remote and historically marginalized areas. Measures such as the Open Government Partnership that increase fiscal transparency and create opportunities for citizen input into public policy are welcome. However, inculcating a culture of accountability within the civil service and security structures also requires fundamental shifts in the way that institutions operate, more active communication with citizens, and engaging with regions and communities that do not trust their governments. Initiatives, such as the World Bank convened Global Partnership for Social Accountability, which link governments and civil society actors, are promising in their focus on the strengthening the practice of socially accountable, inclusive governance among ordinary citizens. These two recent crises have shown that even in relatively strong states like Nigeria and Guinea, the relationship of the state with communities living at the periphery can be a threat to national, regional, and international stability. These two recent crises have shown that even in relatively strong states like Nigeria and Guinea, the relationship of the state with communities living at the periphery can be a threat to national, regional, and international stability. As we enter 2017, African governments, aid agencies, multilateral institutions, global civil society, and the broader community of people who care about ensuring effective and inclusive democratic governance should place social cohesion at the center of their programming and policies.